« Update Your Zune & Get Some Podcasts! We, along with a lot of people in the podcasting community, were excited to hear recently that Microsoft had hired Rob Greenlee to be its Podcast Programming & Marketing Lead for the Microsoft Zune. Rob was doing Internet radio long before podcasting was created. 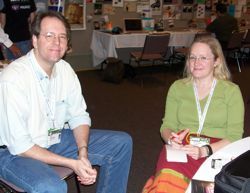 Rob, along with his wife Dana Greenlee, hosted WebTalk Radio, an internationally syndicated radio show, webcast and podcast. Rob also helped pioneer the world of mobile podcasting as the Senior Marketing Manager for Melodeo. And he’s got a Guinness World Record for his role in making the world’s largest glass of orange juice. I caught up with Rob at last week’s BlogWorld Expo and talked with him about the new Zunes, Microsoft’s new podcast directory and more. Interesting discussion, & the Zune manager seems like a decent guy…. But the Zune has a snowball’s chance in h*ll of catching up with iPods. The new Zunes are still clunky, they only work with Windows and Windows is losing marketshare, they’ve only got 1000 podcasts….face it – the Zune is still a second-rate media player. Well, I have spent the last 30 minutes trying to download the Marketplace software and upload our podcasts. We’re trying not to be Mac snobs and be platform agnostic. Doesn’t seem like MSFT has the same attitude. The software is Windows only. I realize I am the only Mac based person in the universe who creates podcast content, but JEEZ! I am clearly missing SOMETHING. Anyone have any insight into how you submit your podcast feed?